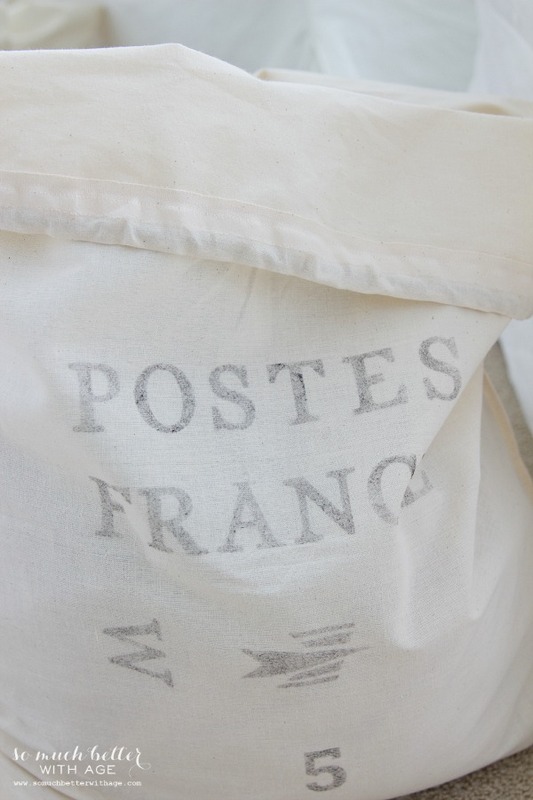 I adore my French laundry bag which imitates a French mail bag. I also have a giveaway at the end of my post. I’ve been on a roll lately… I have another giveaway for you today! It was my birthday yesterday so this month has been a great month for giveaways. I still can’t believe it’s nearing the end of June. Next month I’ll be attending the Haven Conference in Atlanta for a third year in a row and rooming with my BBFF Jenna from Rain On A Tin Roof again! I look forward to it every year, seeing Jenna plus the conference. This year I didn’t think I was going to be able to go but I am! Before Haven, I still have lots of projects to share with you. This handmade project was given to me so read on to learn more about it and for your chance to win at the end of this post. 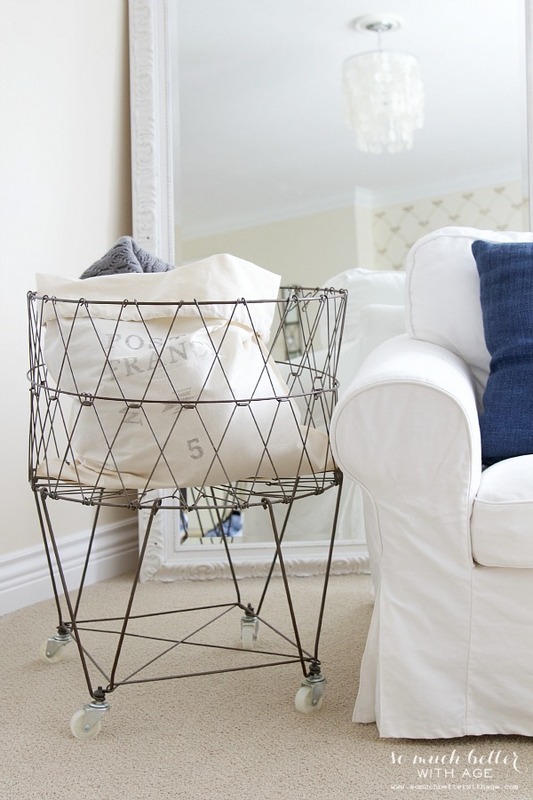 Shal from Spools and Bobbins sent me this gorgeous laundry bag. 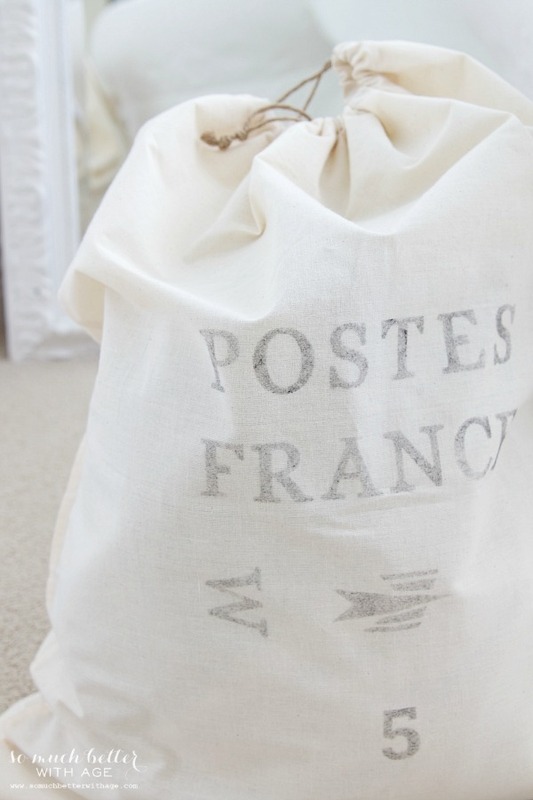 I love that it imitates a French mail bag. I’m all for promoting handmade items so I was happy to offer a giveaway of a similar pillow cover to my readers. And Shal is the sweetest. Her new website is gorgeous with newly stocked items. Doesn’t it look great in my laundry room? I really love how the letters are worn looking. It goes well in any room in my house. I stuck it in this laundry cart and used it for stored blankets. It even looks great in the living room piled with blankets. 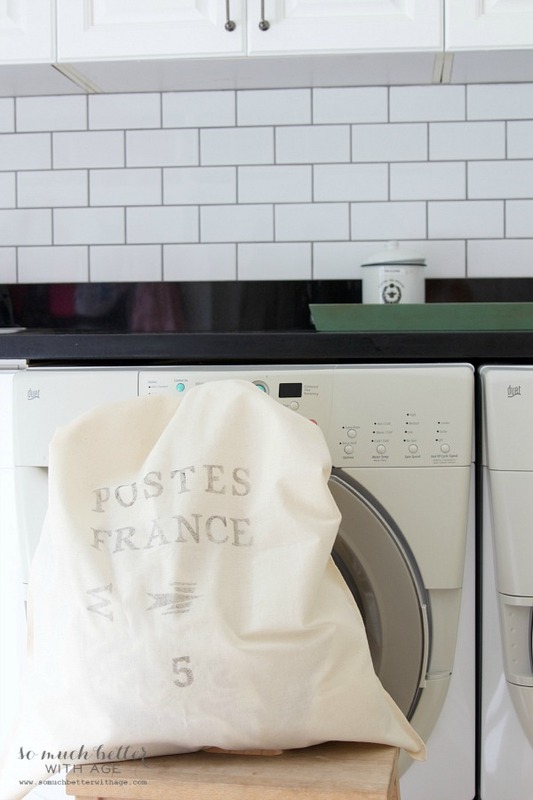 Okay, you can win a pillow cover that is just like this laundry bag. I love the bag!! So cute! Some new designs on my new website and some previous designs in my Etsy shop. 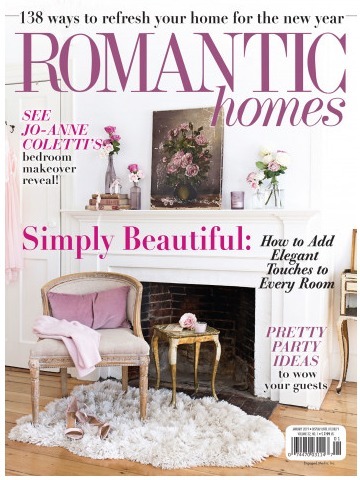 Love all that French inspiration … can’t make all the ideas that pop into my head fast enough. Thank you so much for the beautiful laundry bag, Shal! It’s been such a pleasure working with you. I know my readers love your products. 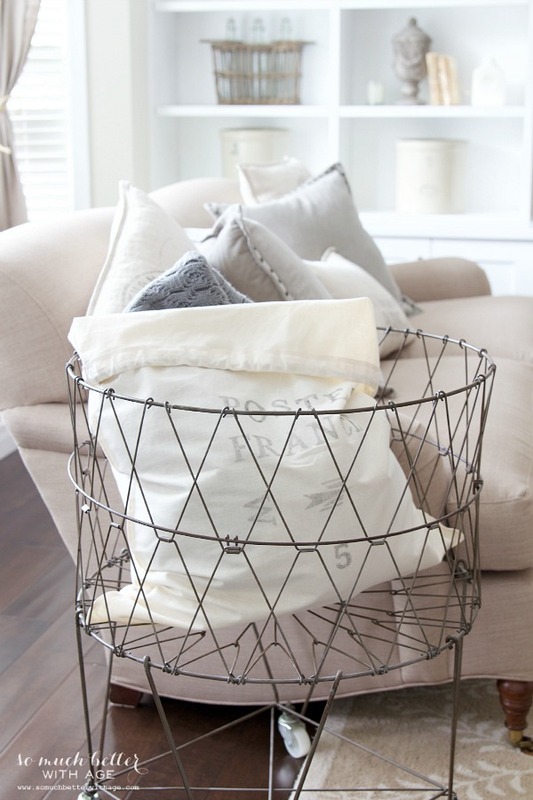 I love the laundry bag and the Family Name Burlap print. What adorable stuff at Spools and Bobbins. 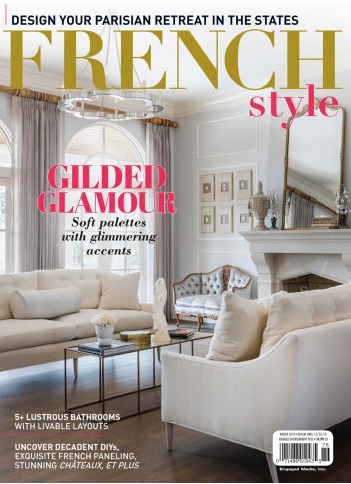 I love all the french inspired decor! 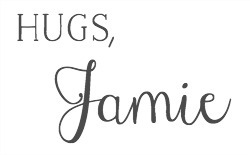 I think one of my favorites is the family name burlap banner! It would be so perfect hanging in an entryway. Thanks for sharing this little shop! The bag is absolutely adorable! Love all the pillows and the menu vinyl! The Paris coordinates pillow is lovely! I absolutely love the Pillow! My new love is everything French County. 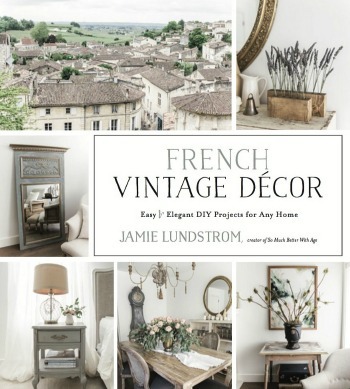 Getting ready to buy a new (to me) home and want to fill it with everything French!! (I am a French/Cajun) This little Pillow would looks so nice in my new Living room!!! Love the Paris coordinates pillow. So many lovely designs!! I love the bag! It would be perfect for my friend’s daughter when she heads off to school. Fabulous bag! I still sit in awe at how pretty your laundry room is everytime I see it, and now you are really making wish I hadn’t walked around from the laundry cart I found last fall at an antique store 🙁 Hope you had a great birthday!!! What a cute bag! 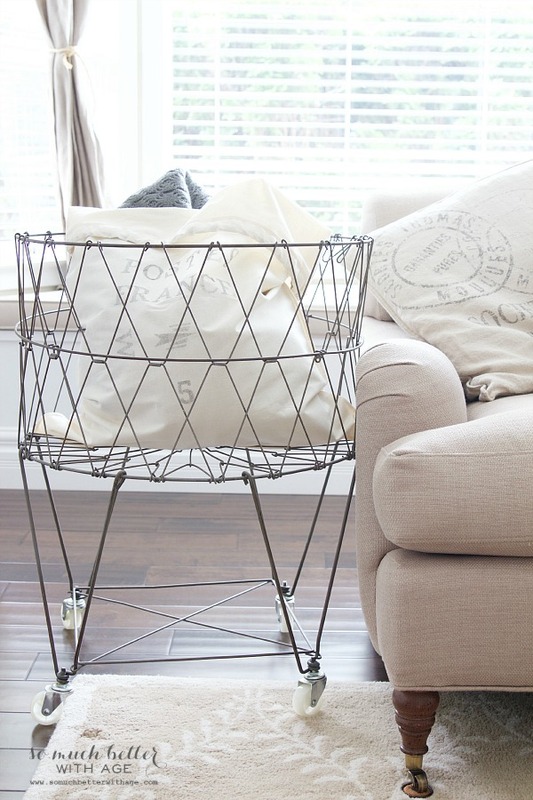 Love the little laundry cart too. Great Post Jamie and happy belated birthday. I trust it was fabulous! 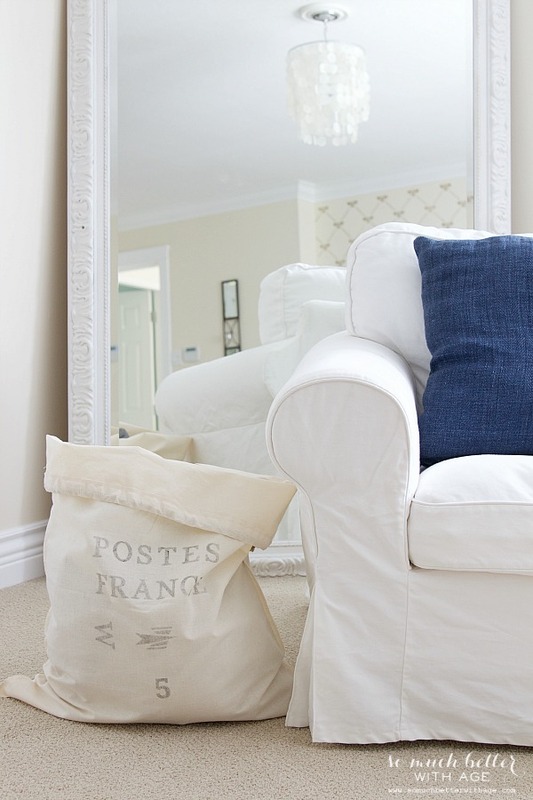 The burlap prints and Paris coordinates pillow cover are adorable! I love the bag. After the last giveaway, I had to like a bunch of her stuff on Etsy so I can order them for Christmas presents!!! Thank you. This would fit right in with my Eiffel Tower collection. With the email name (dee-bee) I have and the bee collection I also have, this would be just the perfect addition. That is a lovely laundry bag. I really like the faded quality of the lettering. Thanks for the chance and have fun at the conference. I love this kind of stuff! Now I know about Spools and Bobbins – that is dangerous! I love everything! But the laundry bag really is my favorite! Such a great bag!! Love the vintage look if it. Thank you for such a nice giveaway!! Blessings!! Such a great bag!! Love the vintage look of it. Thank you for such a nice giveaway!! Blessings!! 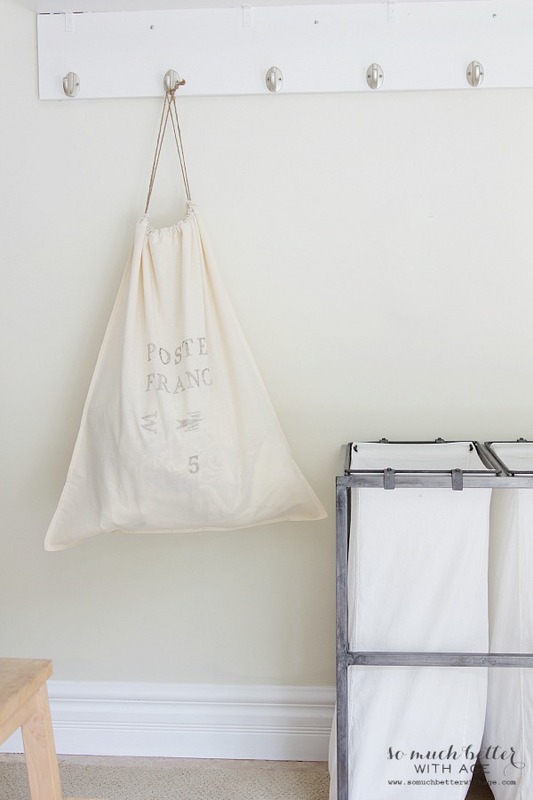 Love this laundry bag. The pillow is a great giveaway. Would love to win. Thank you for the chance. Have a great Friday and wonderful week end. I love all the pillows. I also love the Paris Coordinates Pillow Cover! what a cute laundry bag! The laundry bag is so pretty! Would love to win it! 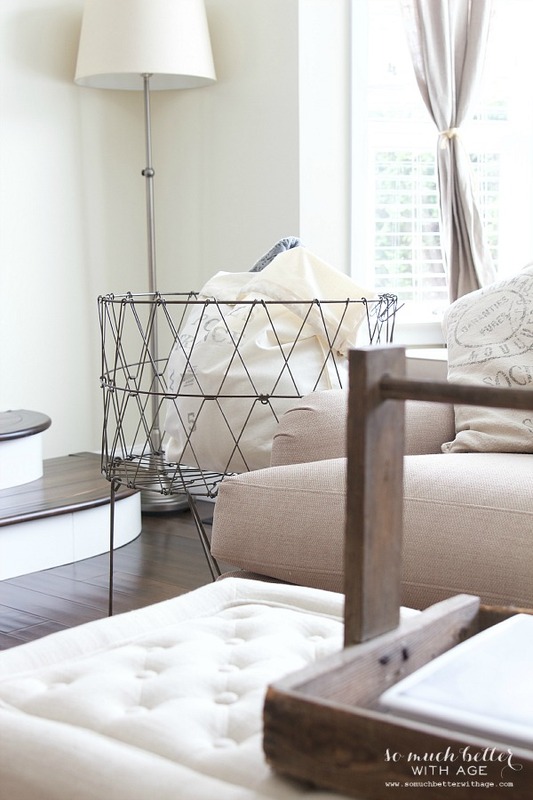 SO many beautiful items on the Spools and Bobbin website. One of my favorites is the Burlap “What a difference a day makes” sign and since I’m a Mother of the Groom I like all the wedding items too. 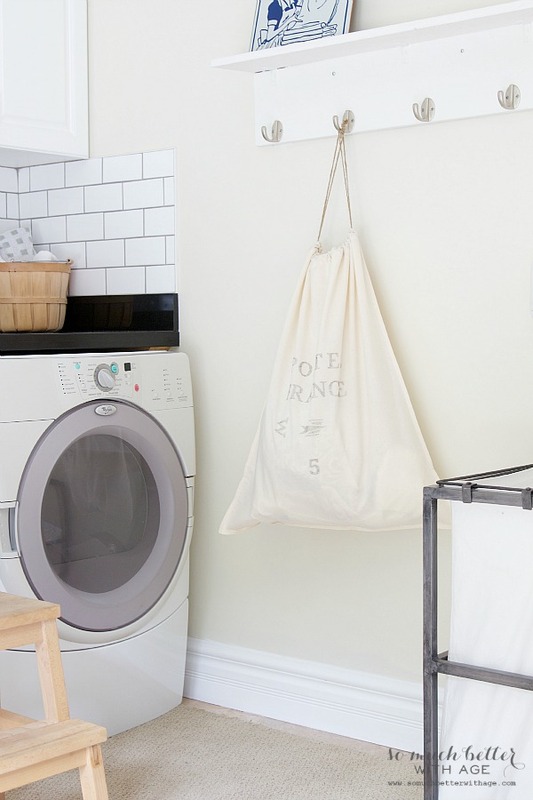 I love that laundry bag and would love to own one. I also love the pillow, it would look great on my couch next to my eiffel tower pillow. I like so many things but my favorite is the pillow cover with Paris coordinates. Thanks for the chance to win. 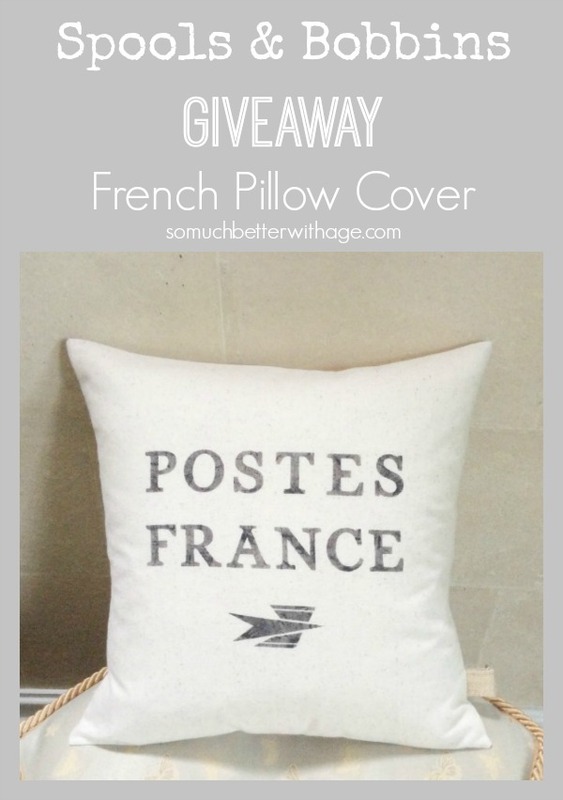 I like the Postes France Pillow Cover! Thanks for letting us know, Shal!